At UKAA we have in stock a large number of Royal Mail post boxes for sale. These items are an iconic part of our heritage making them perfect to add character to any property. All are sympathetically restored by skilled craftsmen and wherever possible we aim to keep their original cages, Chubb locks and keys. You can choose from a pole, floor standing or a wall mounted letterbox. This traditionally British item can be delivered worldwide. Please contact the office for a shipping price. Here at UKAA we are the UK's leading retailer of the refurbished British pillar box. These classically British items have been caringly restored to their former glory by our team of skilled craftsmen here in our workshops in Cannock Wood, Staffordshire. We also have for sale reproduction Royal Mail ER11 post boxes which can be painted and finished in the colours of your choice. We can deliver these items worldwide. Please contact the office for a shipping price. Here at UKAA we are one of the UK's leading retailers of original fully refurbished pillar boxes formerly used by The Royal Mail. These typically British items have been lovingly restored to their former glory by our team of skilled craftsmen here in our workshops in Cannock Wood, Staffordshire. We can deliver within mainland UK, insured and tracked for £25. We can also deliver worldwide. Please contact our office for a shipping price. At UKAA we have for sale original antique pillar boxes and post boxes by Royal Mail. These boxes are fully assembled and are painted to a very high standard in the colour of your choice. The lettering can also be painted in a contrasting colour. These post boxes can be be wall mounted, floor mounted or pole mounted. The poles can be purchased here at UKAA. This typically British item can be insured, tracked and delivered within mainland UK for £25. We can also deliver worldwide. Please contact the office for a shipping price. If you're stuck for ideas on what to buy a loved one for Christmas, look no further! At UKAA we have in stock a large selection of original reclaimed Royal Mail pillar boxes and post boxes. All our boxes are lovingly restored to their original condition by our skilled craftsmen here at our reclamation yard in Cannock Wood. This characteristically British item can be delivered, insured and tracked within Mainland UK for £25. We can also deliver worldwide. Please contact the office for a shipping price. This delightful picture featured below was sent to us by a happy customer in Austria who has recently taken receipt of their post box. At UKAA we have in stock a large selection of original Royal Mail post boxes for sale. These post boxes are an iconic part of our heritage. All our boxes have been lovingly restored by our team of skilled craftsmen to their original condition. This classically British item makes the perfect Christmas gift and can be delivered, insured and tracked within mainland UK for £25. We can also deliver worldwide. Please contact the office for a shipping price. The picture below shows the post box supplied by UKAA to Weatherfields famous Coronation Street. At UKAA we have for sale reproduction Royal Mail post boxes. These boxes are fully assembled here at UKAA and can be painted to a very high quality in the colour of your choice. We can also paint the lettering in a contrasting colour. This fantastic example below shows how effective this style of post box can look outside your property. This typically British item can be delivered, tracked and insured within mainland UK for £25. We can also deliver worldwide. Please contact the office for a shipping price. At UKAA we stock a selection of original reclaimed Royal Mail pillar boxes and post boxes. Each box is sympathetically restored to its former character by our team of skilled craftsmen. Each box comes with its original Chubb lock and key. These items can be delivered worldwide. Please contact our office at Cannock Wood, Staffordshire for a shipping price. Click Here To View The Post Boxes We Have Available. 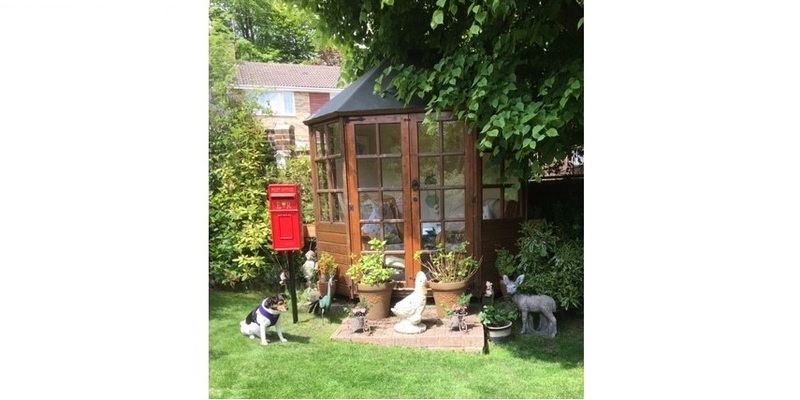 We have just received this delightful picture from one of our satisfied customers who has recently taken delivery of their bespoke painted ER11 Post box. Once you have decided on your chosen colour your post box will be painted to a very high standard here in our workshops at ukaa. This item can be delivered, insured and tracked within mainland UK for £25. We can also deliver worldwide, please contact us for a shipping price. Satisfied Customer with their new Post Box. 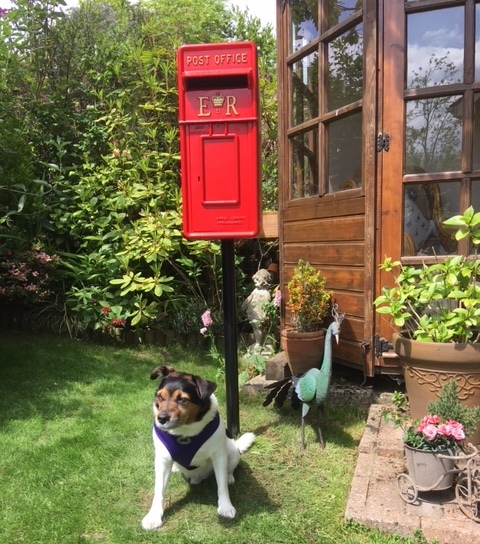 We have just received this delightful picture from a happy customer who has just taken delivery of their original ER11 cast iron pole mounted post box. At UKAA all our post boxes and pillar boxes are expertly refurbished by our team of experienced craftsmen. Sign up to the UKAA mailing list and we’ll contact you with all the latest we offer.